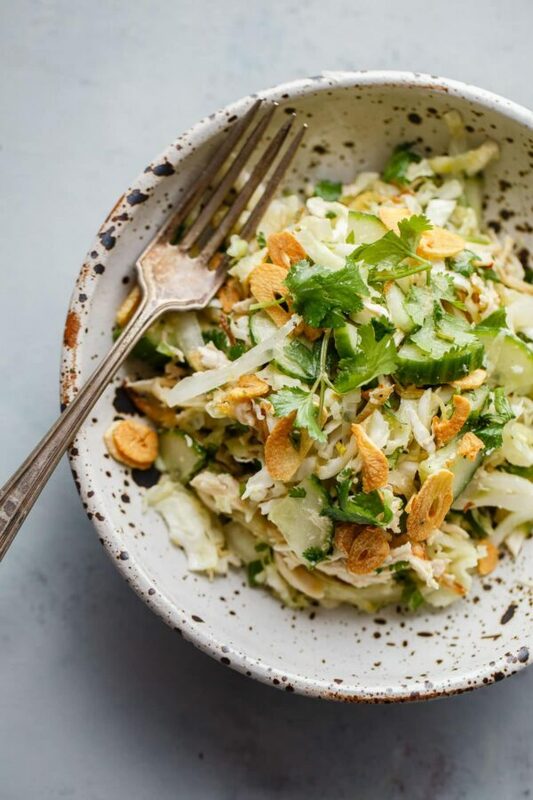 This incredible, flavor-packed Burmese chicken salad, adapted from the Burma Superstar cookbook, gets its heft and incredible texture from green cabbage, cucumber, and shredded rotisserie chicken. This might be the best salad that you’ll make all year. Yes, it really is that good. The recipe name doesn’t do it justice, but I hope that doesn’t discourage you from making it. In fact, I recommend running out to the grocery store and picking up the ingredients as soon as possible. This isn’t your average chicken salad. It is hearty and filling, bursting with flavor and texture, and, while this might be presumptuous of me to assume, unlike any other salad that you’ve made before. Bonus points? 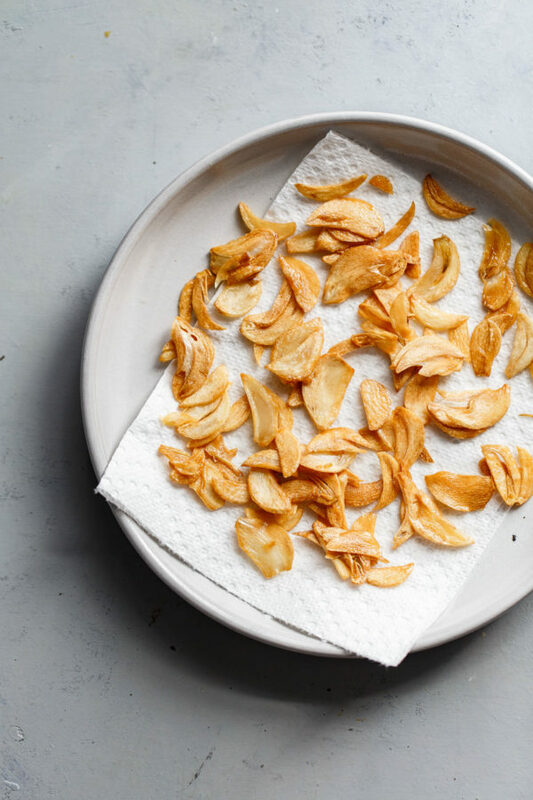 We get to put those glorious crispy garlic chips that we made last week to use! 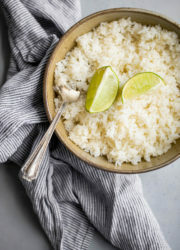 This recipe hails from the Burma Superstar cookbook (affiliate link). If you’re from the Bay Area, you might recognize the name, as it is the cookbook of the well-loved Burmese restaurant under the same name. Whenever I visit my sister in Oakland, I make a point to eat or get take out from Burma Superstar! I’m the first to admit that restaurant cookbooks can be disappointing. I’ve found many unreliable or unrealistic for home kitchens. However, this cookbook has exceeded my expectations. It might be my most-loved cookbook of the year. We’ve made countless recipes from the book and nearly all of them have been integrated into our regular meal rotation. 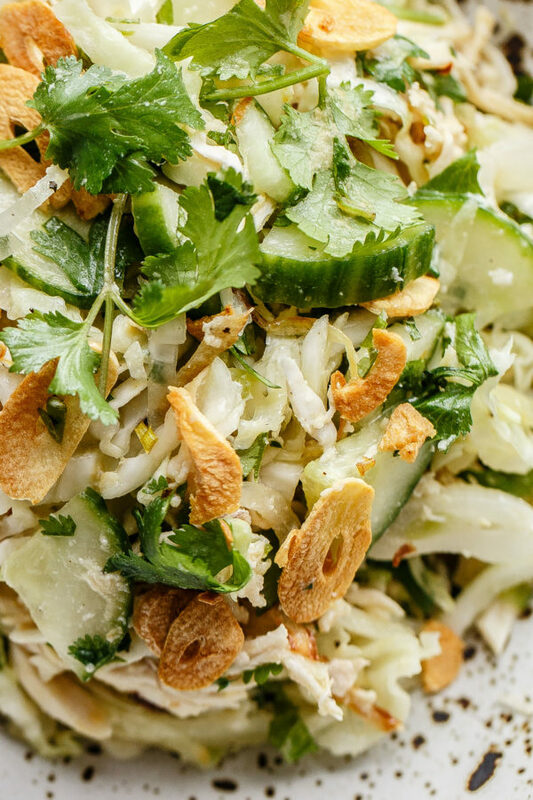 This Burmese chicken salad was one of the first dishes that we tried, and we were blown away. Once you try it, you won’t be able to stop thinking about it! While I can’t take credit for the brilliance of the original dish, I’ve adapted and adjusted the recipe over time. Ingredients have been tweaked and stream-lined for your ease. 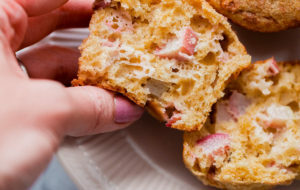 Recipe yield has been increased (trust me, you’ll want every last bite) and favorite flavors have been ramped up. Yellow Onion – this recipe utilizes both raw and cooked onion. 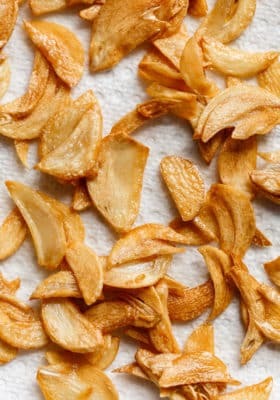 Thinly sliced onion is shallow fried in oil until crispy (the infused oil is used for the salad ‘vinaigrette’) and caramelized. The remainder will be kept raw and tossed with lime juice. Green Cabbage – thinly sliced cabbage provides bulk, texture, and helps make this salad extra filling. 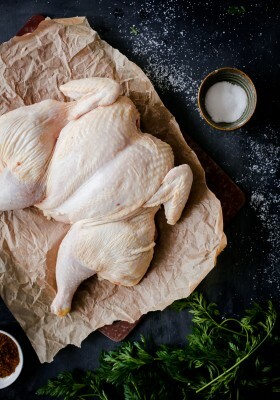 Shredded Rotisserie Chicken – while you can certainly poach or roast chicken for this recipe, I like to turn to shredded rotisserie chicken for its great flavor and ease. I use a mixture of dark and white meat. Cucumber – thinly sliced cucumber adds another crunchy, bright flavor element to this dish, and absorbs the flavors extremely well. Jalapeño – finely minced jalapeño pepper adds a touch of spiciness. Lime Juice – for brightness and acidity! Chickpea Flour – a salad and cooking game-changer. Chickpea flour is lightly toasted in a dry skillet ton the stove. Just a small quantity provides a touch of nuttiness to the salad. You’ll never look at chickpea flour the same way again. Fish Sauce – fish sauce, which is cold-pressed oil made from fermented fish (mainly anchovies), is a staple in Asian cooking. It imparts a salty, umami-rich flavor that can not be replicated. Fish sauce is a strong, distinct flavor profile in this salad, and partially what makes it so delicious. 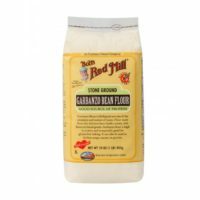 I highly recommend seeking out Red Boat brand (Amazon affiliate link). Cilantro – provides herby, citrus-y flavor. 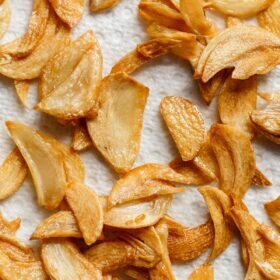 Garlic Chips – while you can leave these out, please know that crispy garlic chips are life-changing and take this salad to the next level. These can be prepped ahead if you’re tight on time. If you’re wondering, “can this really be as good as it sounds?” – the answer is yes, yes, and yes. I can’t wait for you to try it! 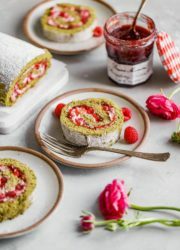 Note: While the salad does require a few speciality ingredients (such as chickpea flour and fish sauce), you’ll be able to use them for countless other applications. I do not recommend making any substitutions for this recipe. 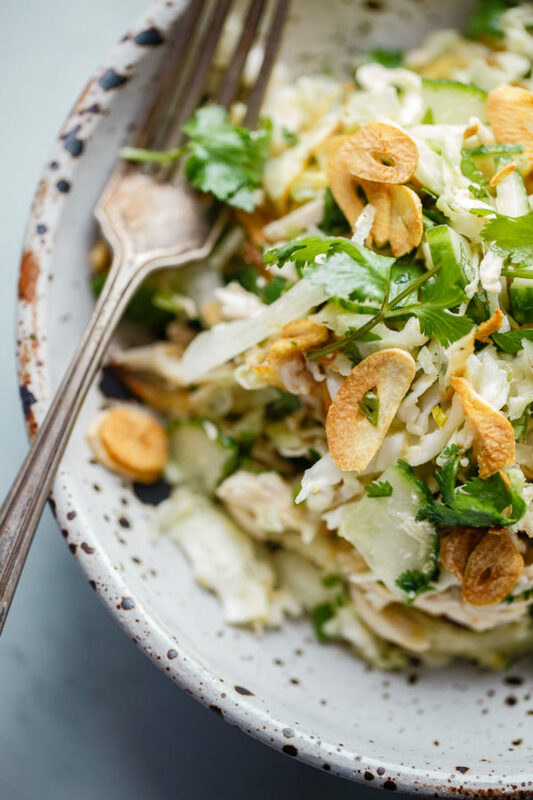 This incredibly delicious Burmese chicken salad, adapted from the Burma Superstar cookbook, gets its bulk, heft, and incredible texture from shredded green cabbage, sliced cucumber, shredded rotisserie chicken, crispy onions, raw onions, jalapeño, toasted chickpea flour, cilantro, and garlic chips. Fish sauce and lime juice impart complexity into each bite. Toast Garbanzo Flour: Spread the chickpea flour into a small dry skillet. Place over medium heat, stirring often, until the flour is golden brown and toasted, roughly 3 to 4 minutes. Transfer to a small bowl to cool completely. Prepare the Salad: Place half of the sliced onion in a small bowl. 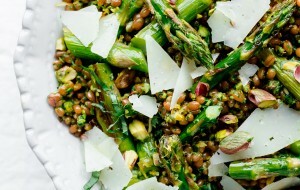 Squeeze one juicy lime over the onion mixture, toss lightly, and set aside while you prepare the rest of the salad. Allowing the raw onion to sit in the lime juice helps temper the raw flavor. In a small skillet, heat the oil over medium-high heat. Add the remaining sliced onion to the pan (they should sizzle as they hit the oil) and shallow fry, stirring the onion continuously, until the slices have shriveled, are evenly golden brown in color, and crispy. Assemble the Salad: Transfer the crispy onions, as well as the cooking oil (this infused onion oil will essentially be the oil in the 'vinaigrette' of the salad) to a large salad bowl and allow the oil to cool to room temperature. Add the shredded rotisserie chicken, cabbage, cucumber, jalapeño pepper, cilantro, and toasted (and cooled) chickpea flour. Toss with tongs until well combined. Add the fish sauce, salt, and reserved raw onion and lime mixture, and juice of the remaining 1/2 lime. Toss again. Season to taste, adding more fish sauce or lime juice to taste as needed. Serve and top with crushed garlic chips as desired. Notes: This salad is best served immediately after it is prepared, but leftovers can hold up in the refrigerator for 12 to 24 hours. However, the vegetables will wilt and lose crispness as it sits. 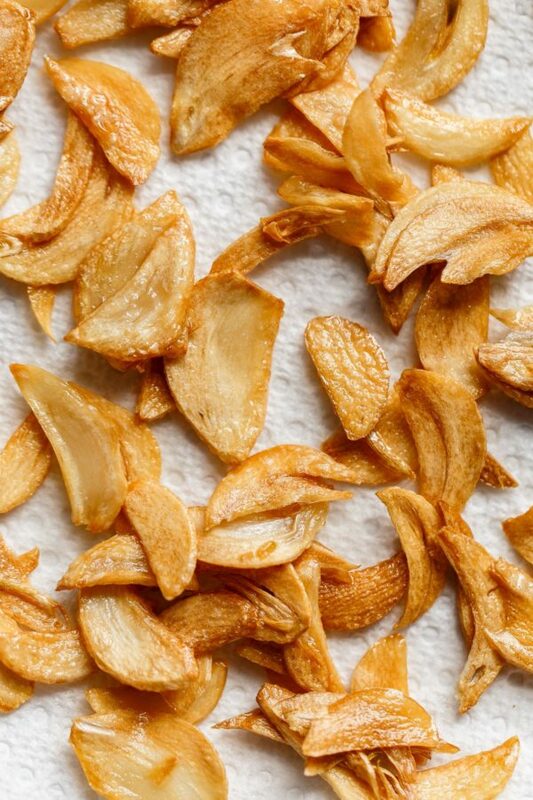 To cut down on prep time, garlic chips can be prepared and made in advance. 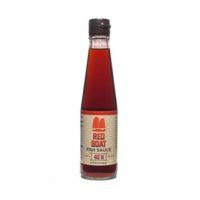 My favorite brand of fish sauce is made by Red Boat. 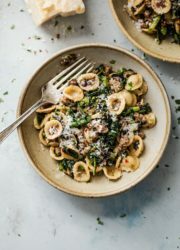 Chickpea flour provides just a touch of nuttiness to the salad, as well as body to the vinaigrette, and I highly recommend it – however, the salad can stand on its own without it. Leftover chickpea flour can be used in baking, batters, and other applications. Adapted, very lightly, from Burma Superstar. I love the crispy garlic chips! 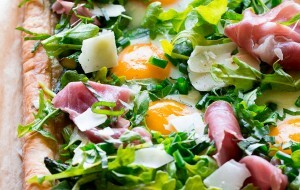 Amazing salad! Thank you so much!!! I’m in LOVE with it – you have to try it! No tea leaves? I was looking forward to finally learning how they did that. Any particularly reason why it was omitted? Hi! 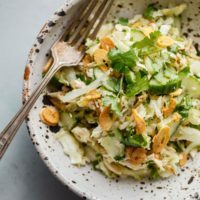 You’re thinking of the famous Burmese tea leaf salad, and this particular recipe is an entirely different salad, which does not use them at all. Hope that clarifies things! I actually haven’t tried the tea leaf salad, and have been wanting to for years. 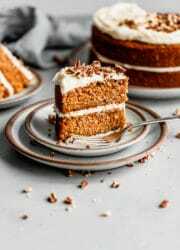 It’s been almost impossible for me to source the right ingredients for that one, so I’ll have to do more research, but I would definitely be interested in sharing a recipe using those at some point. Delish! Want to give this a try! Wit the exception of sweets, almost all recipes call for onions, They do not agree with me and I’m unwell for three days after eating them. At times friends who don’t think it’s possible will tell me there are no onions in something they have prepared. It doesn’t take long for me to know. Are you aware of anything to replace them other than just omitting them? This applies to any type of onion, scallions or whatever. No problem for garlic. So sorry for only just getting back to this question! 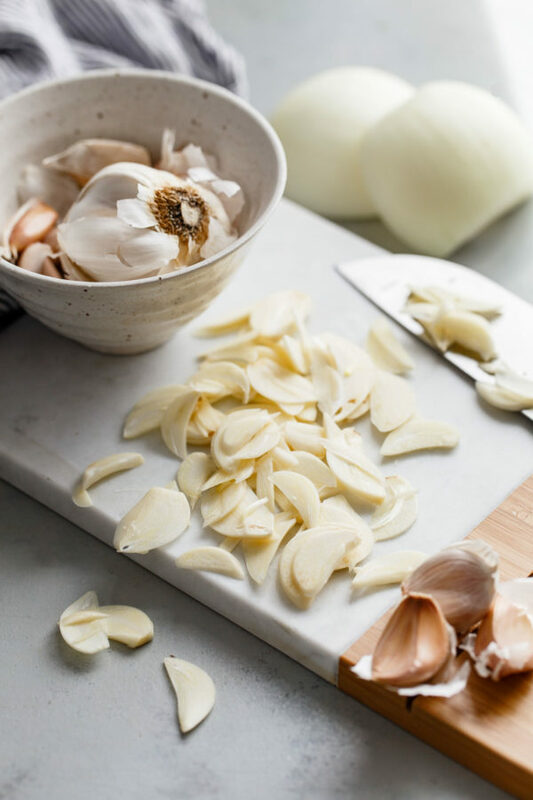 Unfortunately, there’s no obvious substitute for onions – they kind of are impossible to replicate with another vegetable – you could omit them in this case and simply use more garlic chips? I think that would totally be fine! Hope this helps! I made this EXACTLY as written (right down to the brand of fish sauce) and, I must say, I loved every bite! I will make it again this weekend. 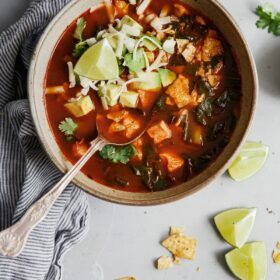 Thanks for a winner of a recipe! I just made this salad. My favorite recipe is Orecchietta with Spicy Sausage with Sun dried Tomatoes. I have to say that Burmese Chicken Salad was not up to your very high standard of excellent flavors. There were perhaps too many flavors in the recipe . It just came out as just a bunch of mixed up flavors. It was the very first recipe of A Beautiful Plate which I would not repeat. I even found garbanzo bean flour at Berkeley Bowl and toasted it. Hey Patty. Hmm.. that’s interesting! I’ve had a handful of people that have made this recipe and absolutely loved it. It’s also an adapted recipe from a very established restaurant/a traditional Burmese style salad, so I’m wondering if the flavor combinations are just not as much up your alley. But, I’m sorry to hear you didn’t like it – but I’m glad to hear that you’re usually a fan. Hopefully you continue to try them and enjoy other recipes in the future!